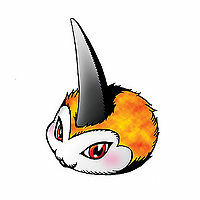 A tiny Digimon that hardened one of the feelers on its head as Punimon. From Punimon, it has accomplished a more animal-like evolution, and is covered in tufty body hair. 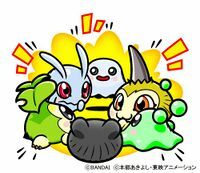 It is still at the peak of playfulness, and it has a prank-loving personality, but its combat instinct has not awakened. Tuno is a Nihon-shiki romanization of 「角（ツノ）」, meaning "horn". 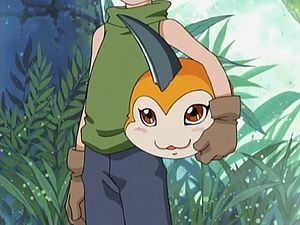 Tunomon is the partner of Ishida Yamato. A student at Togemon's school. He was an outcast, because the others considered him freakish because he could evolve. This changed after he saved Caprimon from drowning. 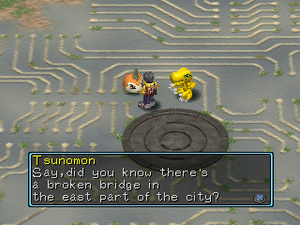 Tunomon telling the Player about the broken bridge. 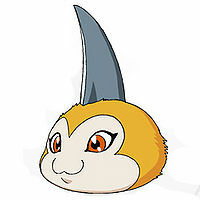 Tunomon is an obtainable Digimon in Digimon World. 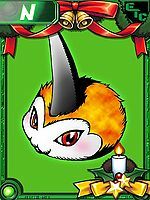 Tunomon evolves from Punimon after 6 in-game hours have passed, with no necessary conditions required. A Tunomon NPC lives in the main Plaza of the Village of Beginnings bouncing around. Its role is somewhat similar to Yuramon's, hinting the player about where to go next as its crucial to recruit some Digimon like Coelamon or Seadramon. Tunomon is also in charge of repairing the broken bridge in the east part of the Village and will be finished once the Player meets Coelamon for the first time and travelled to the Tropical Jungle. Elecmon by having a higher HP, Offense or Speed stat than the others. Penmon by having a higher MP, Defense or Brains stat than the others. Kunemon by letting it sleep in Kunemon's Bed. This has a random 50% chance of achieving evolution. Can evolve to Gabumon, Gaomon or Dracumon. Can evolve to Gabumon or Goburimon. Evolves from Pitchmon or Yukimi Botamon. Can evolve to Gaomon, Gabumon, Psychemon or Elecmon. To obtain avatar part 4 in Chapter 1 you have to battle a Poyomon and a Tunomon. Evolves from Punimon. Can evolve to Gabumon or Elecmon. 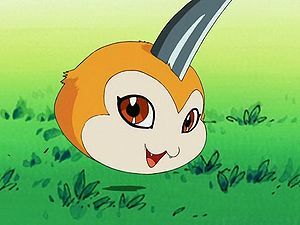 Tunomon is a partner Digimon. Can evolve to Gabumon. 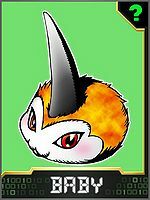 Tunomon is an enemy Digimon. 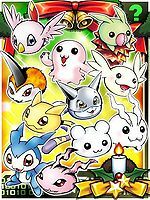 ↑ Digimon Adventure: "The Clashing Ultimates! War Greymon VS Metal Garurumon"
This page was last modified on 21 March 2019, at 00:26.